Dear President Trump: End the airline baggage fee madness! Air travel cannot get any more challenging. Airline passengers are being forced to pay for use of the overhead compartment. As we have already heard and read, the airlines have imposed new baggage fees. This time, it’s in regards to carry-on baggage. Flying is growing more and more impossible by the year. The airlines keep finding more ways to inconvenience passengers. No more hot meals in coach class, a fee to check in baggage at the ticket counter, and paying for meals are the latest of the airlines’ tactics. Now, using the overhead compartments is no longer free. Un-be-lieveable! Will the airlines ever stop making passengers tighten their seat belts? It’s time that the airlines listen to its passengers. Could now be the time to get the law on their side? I took the time to write a letter to President Trump in regards to this growing mayhem. With this letter, hopefully the American public will see significant change. It’s with great anticipation that President Trump will take swift action. With this letter on the President’s desk, and swift action taken, the airlines will have a heart someday. Let me first say that it is a privilege having the opportunity to write to you for the first time. I have written to President George W. Bush on two occasions. He responded both times. I am a published travel writer and travel lecturer based in northern New Jersey. My web site is DEKTravelJournal.com. Recently, I did one of my travel presentations at a library in Alexandria, VA. It was the very first time lecturing outside the Tri-State area. It was a great experience. Mr. President, I am writing to you with regards to a growing problem. The problem lies within our country’s airline industry. Airlines just keep finding new ways to make passengers more uncomfortable; uncomfortable with the entire process of just getting from point A to point B, and in both directions. I recently read and heard that American Airlines and United Airlines are now charging passengers for the use of the overhead compartments. Mr. President, this is hideous, truly hideous. Can’t the airlines find some other reasonable way to make money, other than harass passengers? Will the airlines ever have a heart? Passengers already pay to check their luggage at the ticket counter and at curbside check-in. Enough is enough! My brother and I are flying to Orlando in April, and we usually travel light. Each of us carry one small suitcase per person, along with a carry-on bag over our shoulders. Each little suitcase fits the overhead bin perfectly, no problems. Now, we have to pay??!! The only bags we can carry on now without paying a fee is our smaller carry-on bags that will have to fit underneath the seats in front of us. Will they fit? Doubtfully! Sir, this nonsense has gone far enough. It is becoming clear and convincing that passengers have barely any rights at all. Sir, you’ve been a businessman for a long time. Your ideas for our country’s businesses make a whole lot of sense. What airlines should do is charge a fee for passengers who carry on over-sized baggage which they ASSUME will fit the overhead compartment. They often attempt to squeeze their monster-size carry-on bags in the overhead compartments, hogging the room from other passengers. Totally inconsiderate, right? They hold up the passengers who are boarding the same flight. They should be charged the fee, not everyone!!! It’s not fair to charge everyone, sir. What wrong have the passengers done? 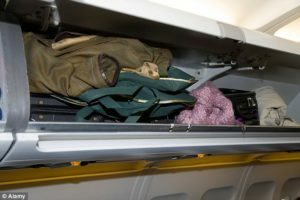 Only the passengers who attempt to carry aboard large carry-on bags which they assume will fit, when they know it won’t fit, should pay a penalty. Often, they disregard the flight crews’ advice to gate check their bags. This is what SHOULD be done. In addition to that, they should be charged the baggage check-in fee. That’s the right way it should be done. Would you agree with me, sir? Airline passengers’ rights are being flat-out violated. This cannot get out of hand. This nonsense must stop NOW, FOR ALL-TIME SAKE. Airline passengers deserve the right to travel peacefully and at their leisure. Amtrak allows up to two carry-on bags per person, excluding personal items (ex. laptops and purses). They allow up for four checked pieces of luggage, with the first two being free. The additional two pieces are twenty dollars each. Now, that’s fair! Please be sure that the appropriate people get on top of this issue. I am seriously wondering if Congress can weigh in on this situation. Mr. President, I urge you and/or Congress to look into this growing problem. Can the airlines’ rampant baggage fees be struck down? Airlines cannot take advantage of passengers anymore. They cannot make them pay for every step of their travels. Airline passengers have given up more than enough over the years, including hot meals in coach class. They’re even subjected to a rigorous security screening process. Making the passengers pay for the use of the overhead compartments is over-the-top abusive. The holiday season is already in high gear. This is the wrong time for airlines to be taking advantage of passengers. Airline passengers can no longer shell out one fee on top of another. For all-time sake, the greed must end. It’s time for the airlines “to make the skies friendly again”. Thank you for your attention in this matter, sir, and I look forward to hearing from you soon. Merry Christmas to you sir, Melania, and your entire family. Will it fit? Here, a passenger tries to fit an over-size carry-on bag in the overhead compartment. 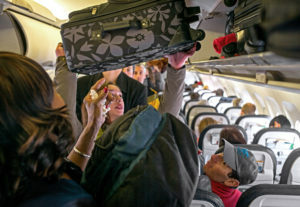 Airlines are beginning to charge passengers a fee for using the overhead bin. But, everyone? With this letter having been sent to the President, it is with great anticipation and hope that the airline industry would finally come its senses. Hopefully with President Trump’s intervention, the airlines can go back to the drawing board and find a reasonable way to treat passengers fairly. Whose bright idea was it to impose a fee for stowing carry-on baggage? The overhead compartments are supposed to be and meant to be free. The airlines, including American and United, have to learn to be transparent. They can no longer do what they want and turn a deaf ear to passengers. Airline passengers are tired of paying excessive fees. Once the madness comes to an end, we can all finally sit back, relax, and enjoy the flight.